Here it comes - the start of another Japan trip report! 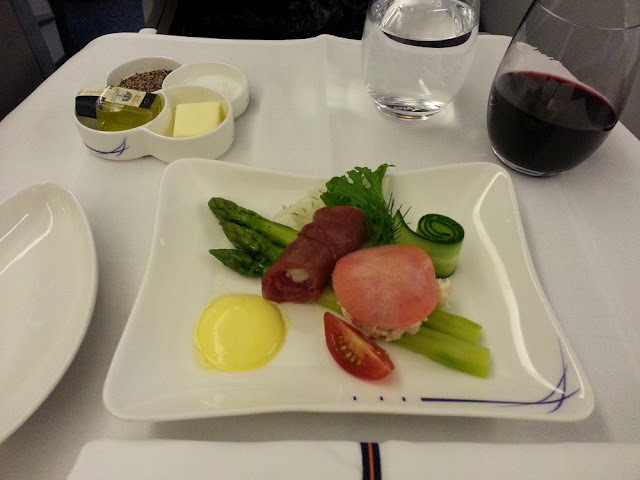 My wife and I usually fly one of the Japanese airlines whenever we go, but this was our first time trying out ANA's business class (a mileage award), so I figure that's a good place to start this report. I'll try not to be long-winded but this is still gonna be an epic post, with lots of pics. Anyone Googling in about ANA's staggered business class, this post is what you're looking for! Hopefully any of my semi-regular readers wondering how the other half lives on international flights will be interested too. On this trip, my wife actually flew out a couple weeks ahead of me to visit her family, and I joined her later. So I was flying alone on the outbound leg. 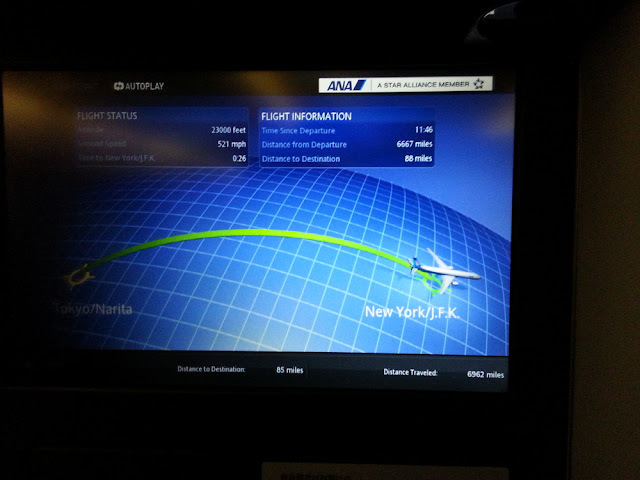 I was on flight 1009 from JFK-NRT - the new second daily ANA flight on this route, just upgraded to their "Inspiration of Japan" staggered business class layout. Pretty impressive - none of the US airlines even fly twice daily from NYC to Tokyo! ANA must be doing something right. Much better than waiting at the gate! 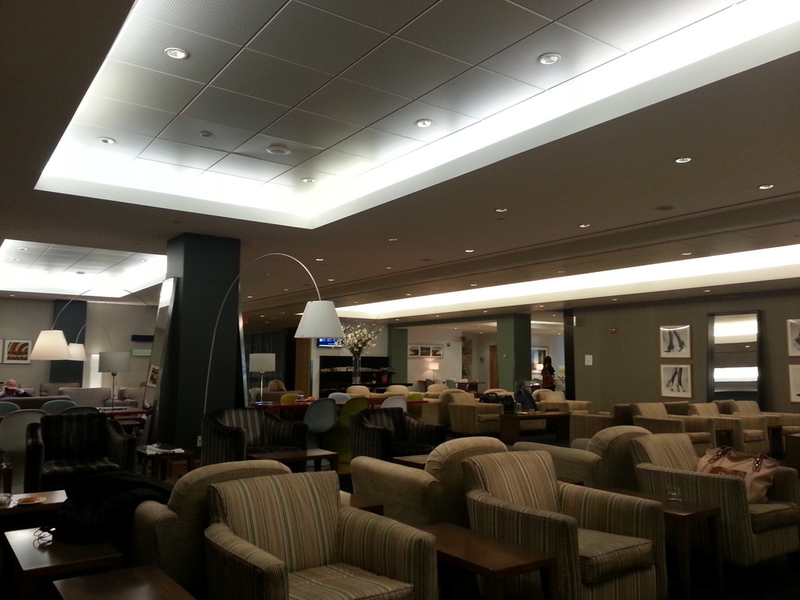 The lounge was nearly empty when I arrived, although it filled up fast. You'd think you'd be immune from screaming babies in a business/first class lounge, but think again. Shortly after I sat down, a family arrived with a tantrum-throwing toddler in tow, who promptly began smashing dinnerware onto the floor in between his screams. 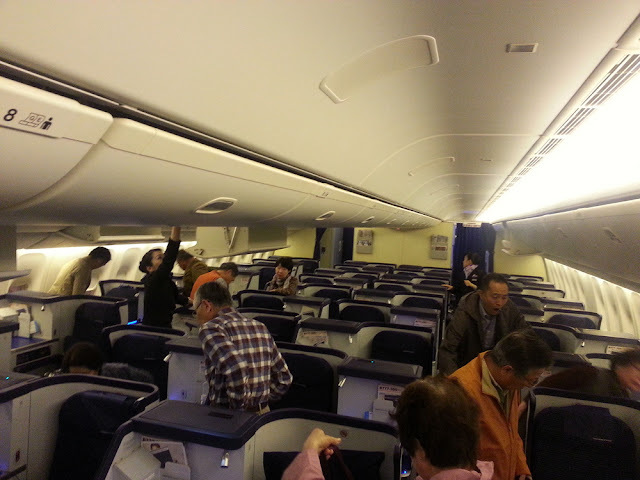 When I boarded, several flight attendants were standing in the aisles waiting to greet business class passengers. I was surprised and happy when one of them greeted me with "Good evening, Mr. Williams". How did she know? I hadn't yet even made it to my seat! I guess she could have seen my boarding pass in my hand, but she still must have had the whole cabin memorized. The window-window seats in this layout really can't be beat. You've got almost total privacy, plus aisle and window access. Of course, all seats have a large table area next to them, but which side that table's on alternates from row to row. In window-window rows ("window seat" actually by the window), you cannot really see anyone else on the plane. This is the view of the cabin from one of these seats - I was holding the camera up, so normally I couldn't even see the top of that guy's head. 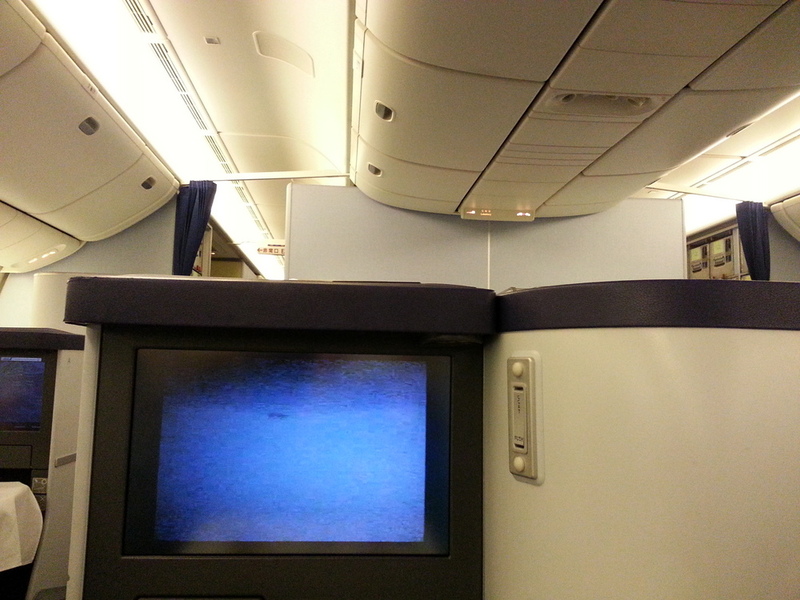 Further to the right, you just see your partition, so you can't see anyone across the aisle. It's actually very comfortable, because you have two ways you can stretch out - either put your feet up like that, or put them underneath. And when you're sitting (as opposed to laying down), you have basically unlimited legroom - not even Shaquille O'Neal would max it out. 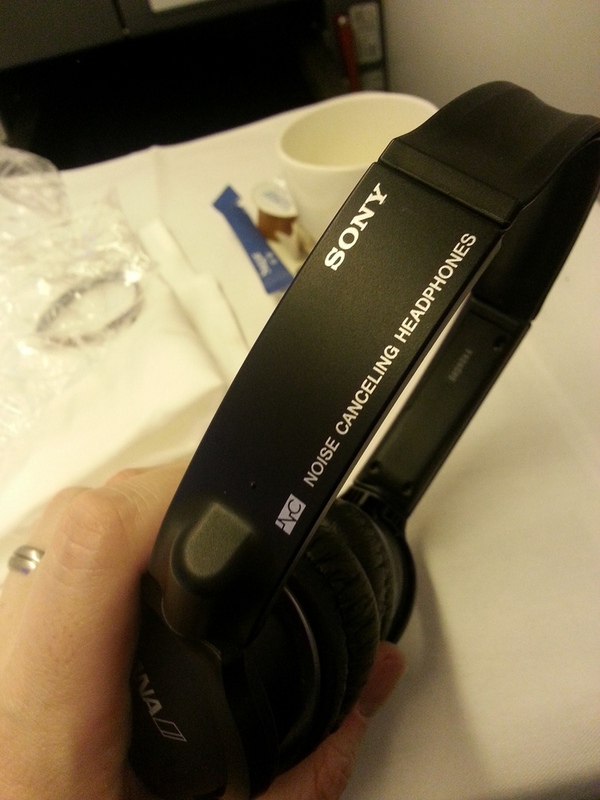 ANA gives (I should say "loans") you a pair of Sony noise canceling headphones for the trip. They work quite well, although I haven't tried any others so I don't know how they compare to, say, Bose QC-15's. I can definitively say that compared to nothing, they're awesome. They really do cancel out a lot of the ambient noise in the plane, making it easier to hear movies or music and causing less fatigue. On the downside, they use a proprietary plug, so I wasn't able to use them to listen to my own music on my phone. 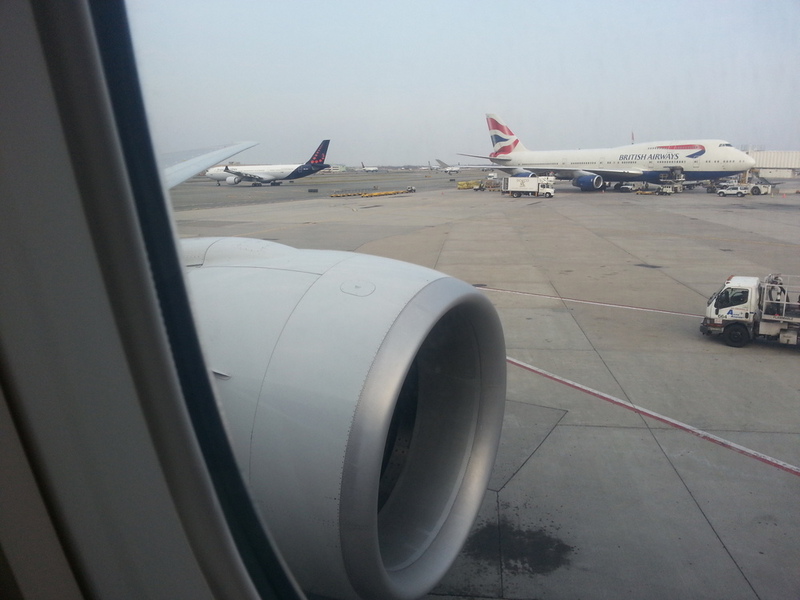 Here's a view you probably won't see for much longer at JFK - a BA 747-400 sitting at the gate. Actually there were four 747-400's parked almost right next to each other as we left - this one, plus two more BA's and a Qantas! I don't know how much longer you'll see four passenger 747's side by side anywhere - I wish I'd gotten a pic of that. We left on time and had a powerful takeoff. 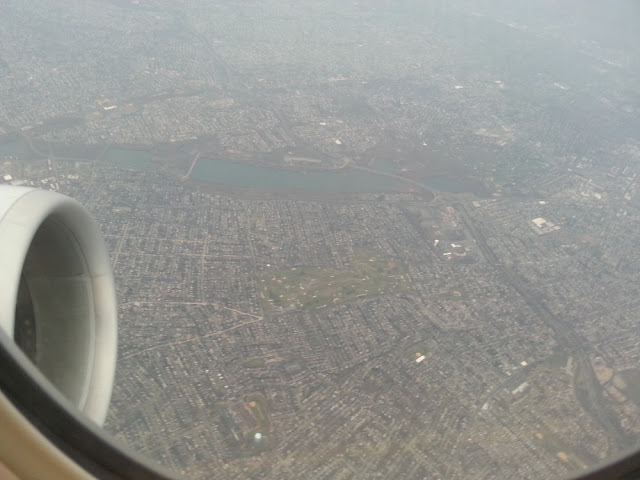 At this moment, we were flying almost directly above my house. 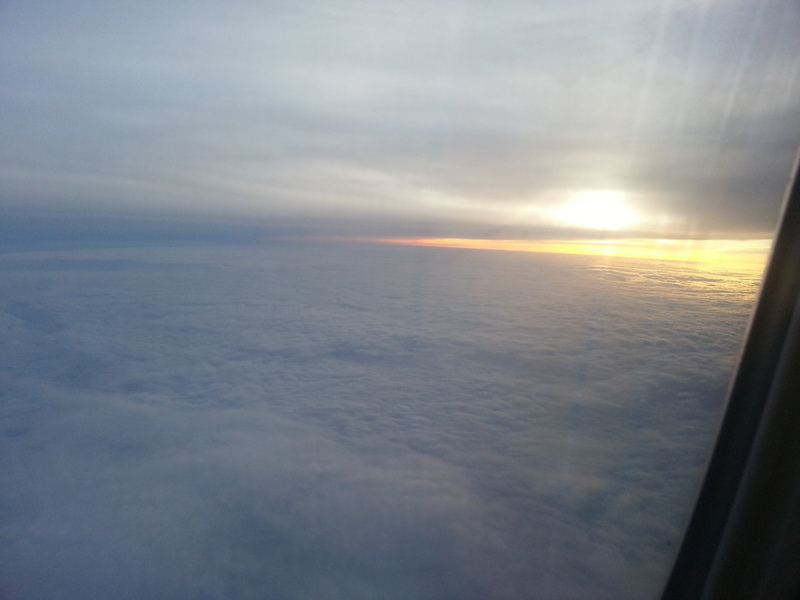 This was just at 10,000 feet. The sun never really sets when you're flying westbound on this route - so this was the view I had for about the next 10 hours. It was time to sit back and enjoy the meal service! 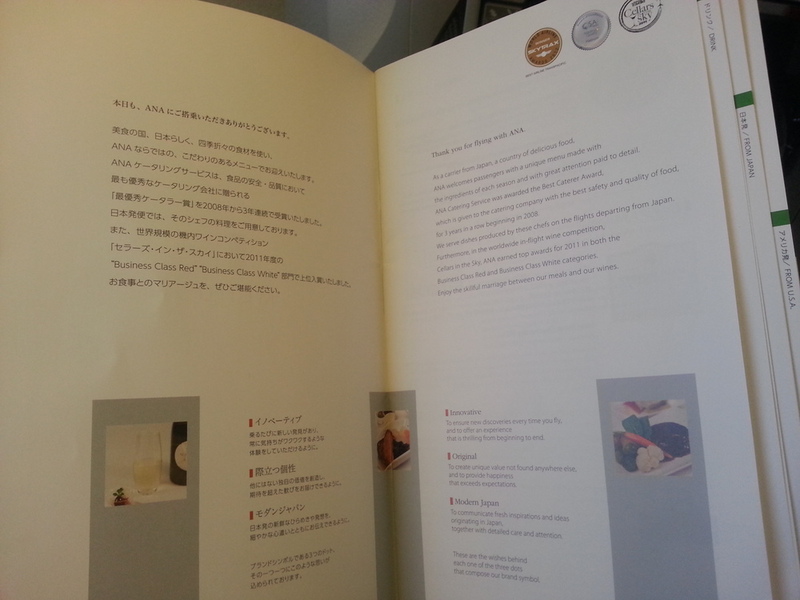 The introduction to the multi-page menu. Everything has both a "Japanese" and "International" option - I knew I'd be eating plenty of Japanese food in Japan so I ordered everything International (also, my wife wasn't all that happy with the Japanese food on board). I actually screwed up and ordered something from the "From Japan" part of the menu (as opposed to the "From USA" that you're supposed to order from when flying out of JFK), but surprisingly they made it for me as best as they could. 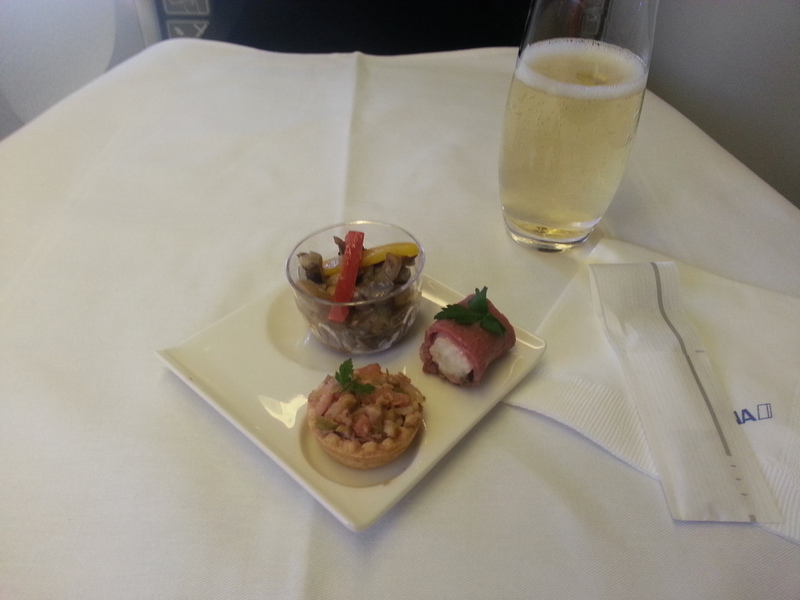 Appetizer and champagne. Part of this was beef tartare. The glass bowl was mostly mushroom. I don't remember what the meat wrap actually was. Second course. Since I ordered from the wrong part of the menu, I actually never did quite figure out what this was (and I forgot to look it up on the way back). Some sort of fish thing wrapped in a pastry of some sort - like a cold seafood Wellington. Plus prosciutto and melon and a small salad. My steak. I ordered it with a red wine sauce; it wasn't supposed to come that way on this leg, but they did give it to me and they didn't even question it. Ice cream dessert. I ate everything on all of my plates - it was actually pretty good, and not just "for airplane food". 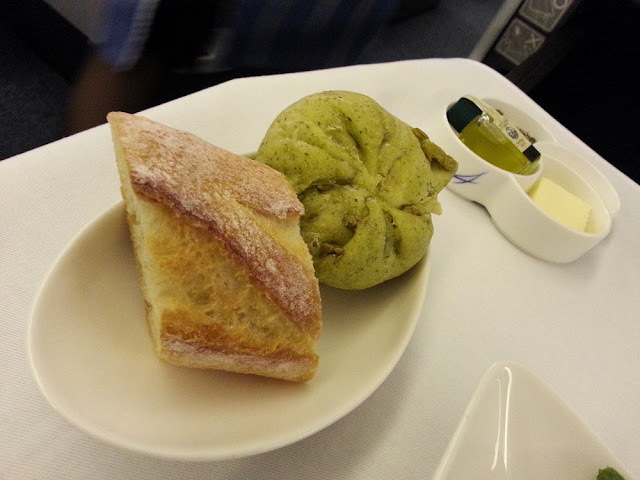 Don't listen to anybody that says it's impossible to serve good food on a plane - that's just what they tell economy class passengers to keep them (us) from complaining. After dinner I sat back and watched both Lincoln and Looper on the AVOD system. I was a little disappointed that, while the screens are bigger than they are in economy, there's no difference in resolution. That actually makes everything obviously pixelated. On the plus side, they had a really good selection of movies this time, but I was too tired to watch more after my second. 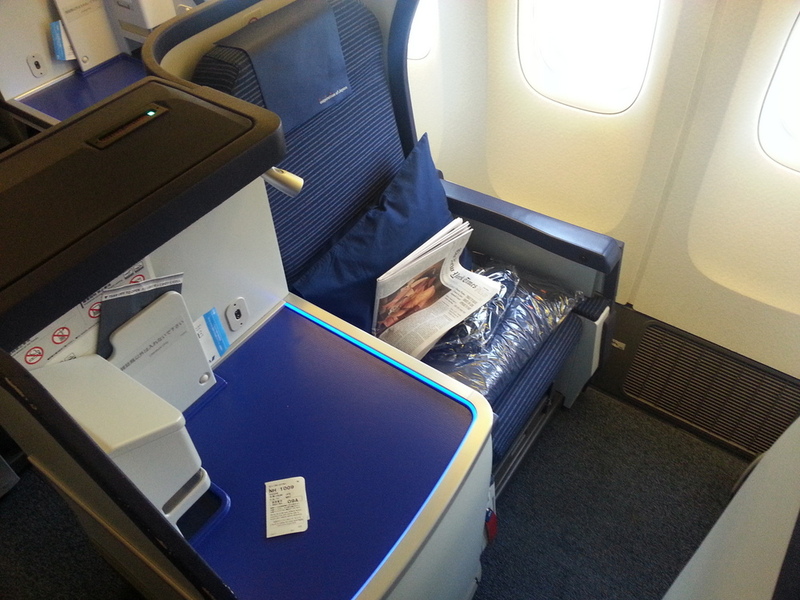 ANA doesn't do a turn-down service in business but the seats go flat with the press of a button, so no big deal. I tried making my seat flat but at 6'4", I'm a little too tall to fully lie down (the bed seems to be about 6'2" - just barely too small for me). I managed to contort myself a bit to be comfortable enough to sleep, apparently, because when I next opened my eyes it was several hours later. Sorry about the lighting, but I had to use the reading light to take this photo (and eat!). I think this was a seafood and spinach lasagna. 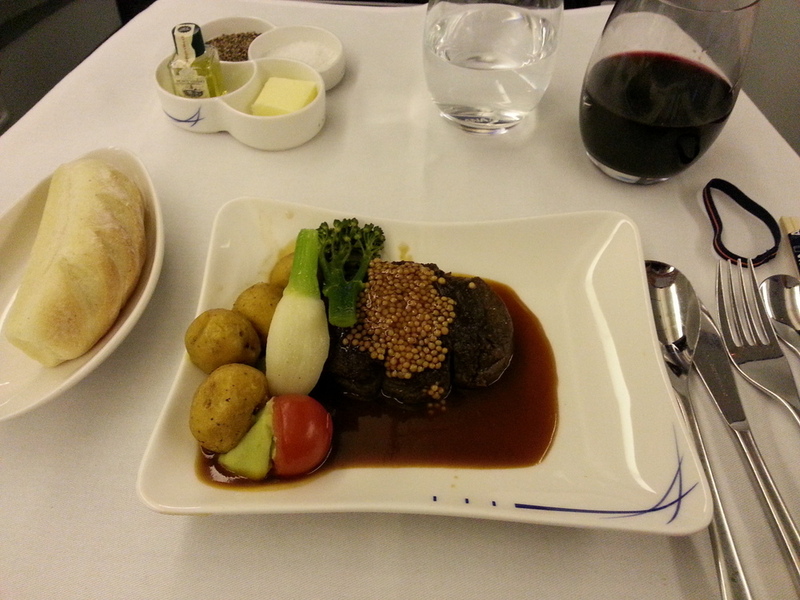 It was also really good - maybe even better than the steak, though the second meal is only a single course. After one of the thankfully less eventful landings I've had at Narita, I snapped this photo of the cabin as I was de-planing. 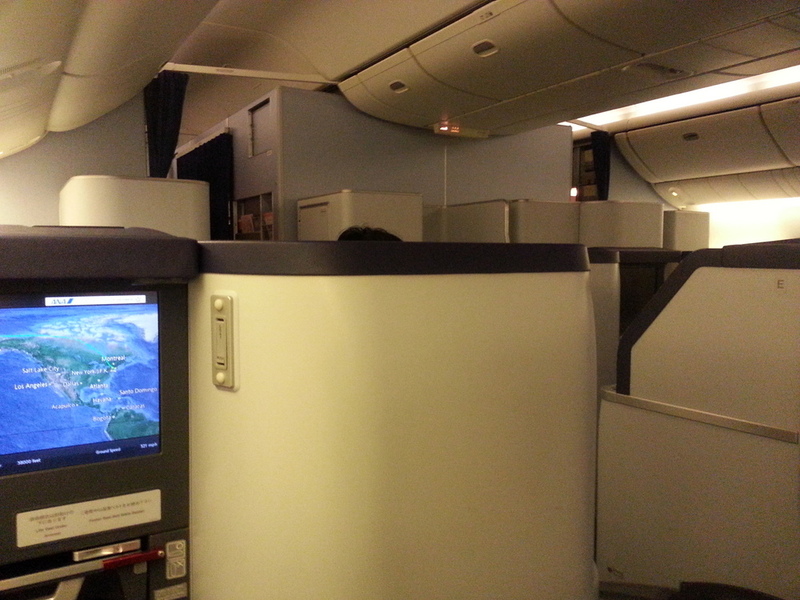 This is one of three business class cabins on this plane - there's one behind about this same size, and another in front that's tiny and very private. 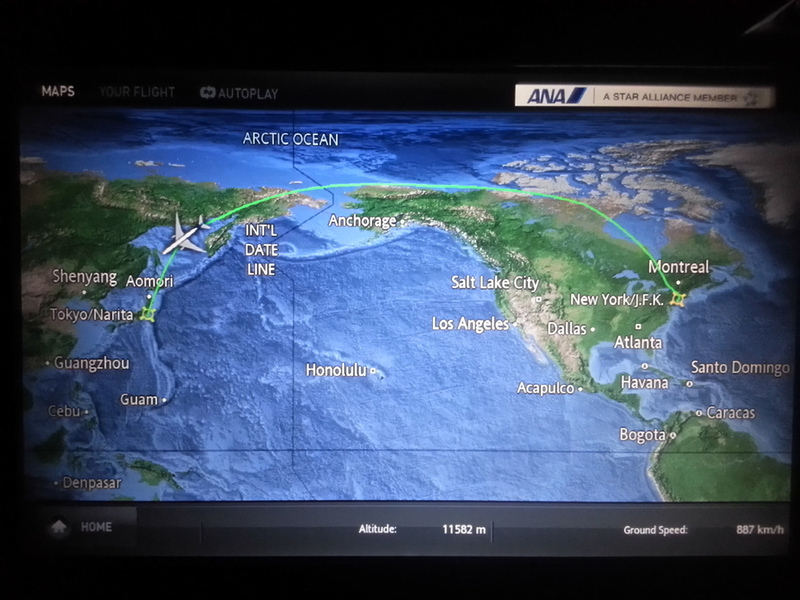 ANA really goes after the premium passengers on this route. 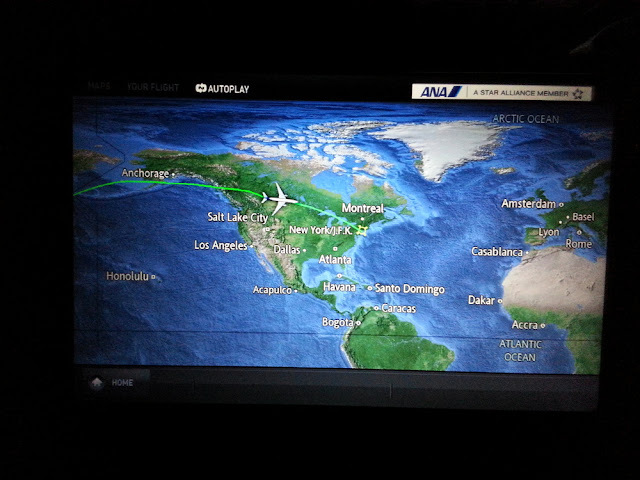 We got in at 9:08PM (according to Flightaware), which was on time but is a bit late for a scheduled flight into Narita. After clearing customs and baggage claim, it doesn't leave much time to get to Tokyo and your hotel before the transit system shuts down - but I made it. Our return was on flight 1010 from NRT-JFK - also the later flight, but this one's actually a better schedule because it both leaves and arrives at around 4PM. 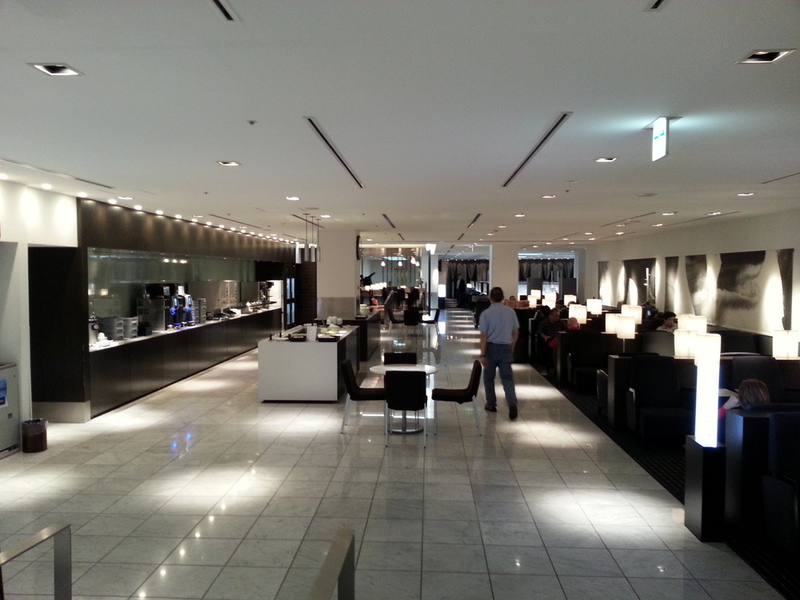 ANA actually has about five lounges around Narita Airport - this one's probably not one of the best, but it was near our gate (44). It's tastefully decorated and lit in a modern style, with good food options (including a noodle bar! ), but it has the feel of a finished basement - it's pretty small, in kind of a dead area below the main gates, and has no windows. I grabbed some sandwiches and a beer - after 10 days in Japan, you kind of get used to having beer at all hours of the day and being buzzed basically all the time, because that's what everybody does there. 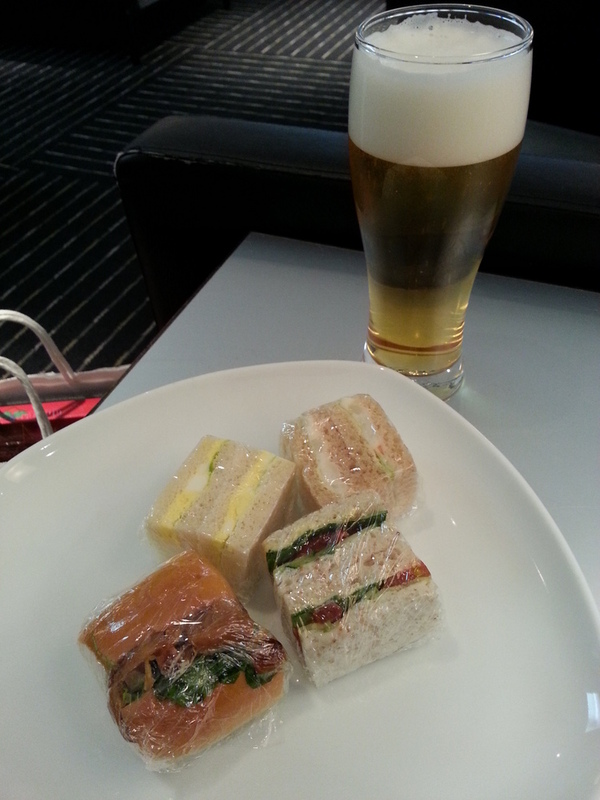 They have a beer dispensing machine in the lounge that pours a perfect glass of beer every single time, head and all. When I first poured this one, the head was just peaking over the top of the glass - all at the push of a single button! I was amazed. At least I got a pic of the plane this time! Already hooked up to the tug before we even started boarding. My wife's seat. All the window seats are singles so we sat in the middle (each middle row has two seats). It can still be hard to talk, because there's an immovable partition between the seats, plus a large table. You really need to lean to be heard. I gave my wife the inside seat and took the outside aisle seat myself - the outside seat is the worse seat between the two, because you're not as protected and are right on the aisle where people can brush past you and where things like other passengers' reading lights can be more bothersome. So I definitely didn't feel as secluded on this flight as I did on the outbound. On this flight I didn't have anyone greet me by name but I did have one of the flight attendants come over, lean down and introduce herself by name, and tell me to let her know if I needed anything during the flight. 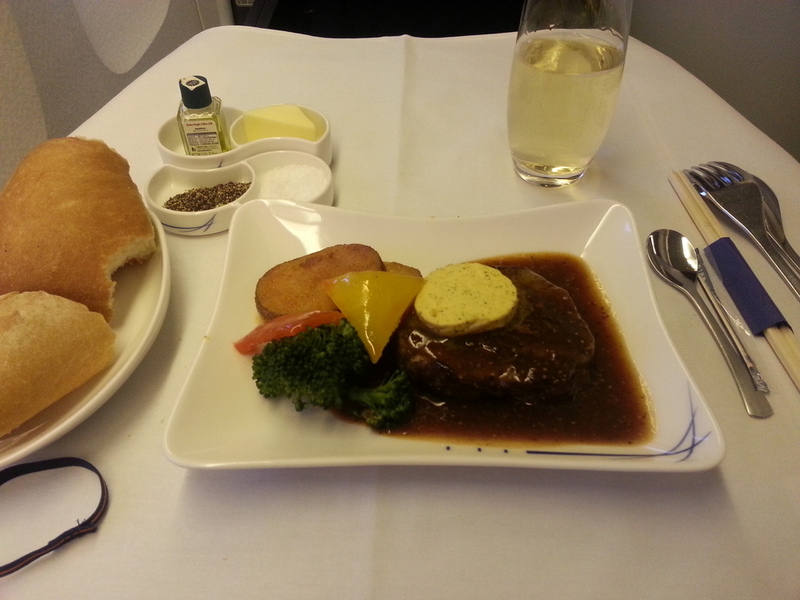 I love ANA flight attendants. Here's something you don't often see on a Japanese airline - the seat belt sign came on during the meal service, and the flight attendants had to suspend it. Japanese airlines rarely, in my experience, turn on the seat belt sign in flight, so when they do - and especially during a meal service - it means they're expecting things to get rough. You can see that we were flying through storms on the monitor - that's the forward-looking camera showing dark clouds. Anyway, I was just counting the minutes until this was over. Today's appetizer. A cheese/olive mixture, bread sticks and I think some kind of tofu thing on a zucchini slice. That part actually wasn't my favorite, but again I ate everything. Second course. I believe that's a piece of cured beef wrapping something (I don't remember what), plus what looked and felt like a pickled radish slice over some kind of seafood salad, then asparagus and cucumber. 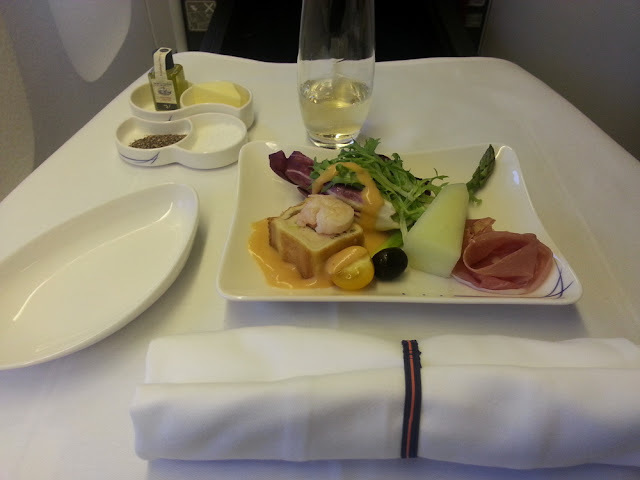 The flight attendant explained what the sauce was but I actually didn't get it - it seemed something like hollandaise, though. Steak again. It looks a bit different than the earlier flight but I actually ordered the same thing - this is what it's supposed to look like, because this is what's actually on the menu on this leg. That's mustard seed and a red wine sauce. Special mention to the bread - it looks weird, but that green thing is a steamed bun with pesto. It was actually quite delicious. 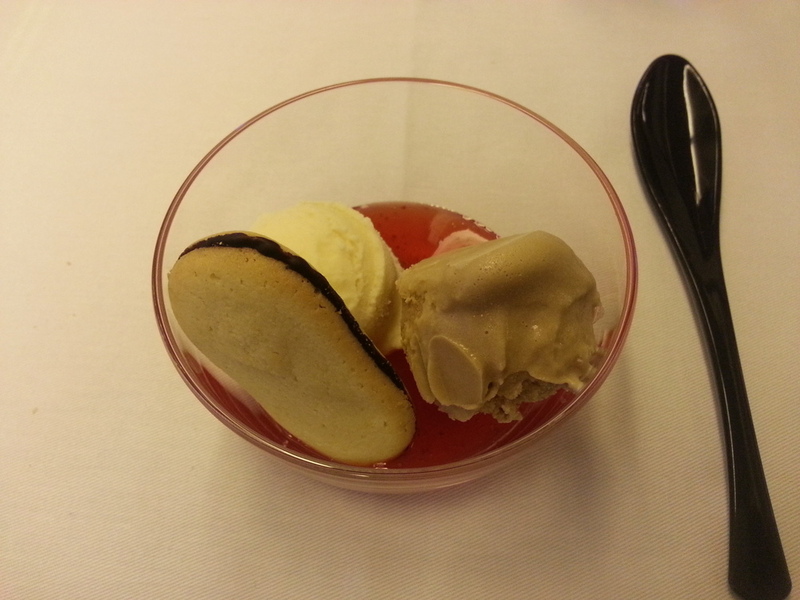 Dessert, from Pierre Herme. I think I can honestly say I have never tasted anything more vanilla. It was almost too much vanilla. It was really good at the beginning, but by the end I was a bit overloaded on vanilla. It needed a raspberry sauce or something to go with it. After dinner, I watched Skyfall (disappointing!) and then fell asleep again. I was surprised when I woke up to find that I'd been asleep for about six hours! Literally as soon as I woke up, a flight attendant came over, knelt down and asked me if I'd slept well and then if I'd like anything to eat or drink. I was still in a stupor so I couldn't even think of how to answer those questions - all I could think of was how embarrassingly bad my breath must smell and this cute flight attendant was talking to me like 5 inches away from my face. What I said was "I just woke up", which was supposed to explain my indecisiveness (and my bad breath) but I think just made for kind of an awkward moment. 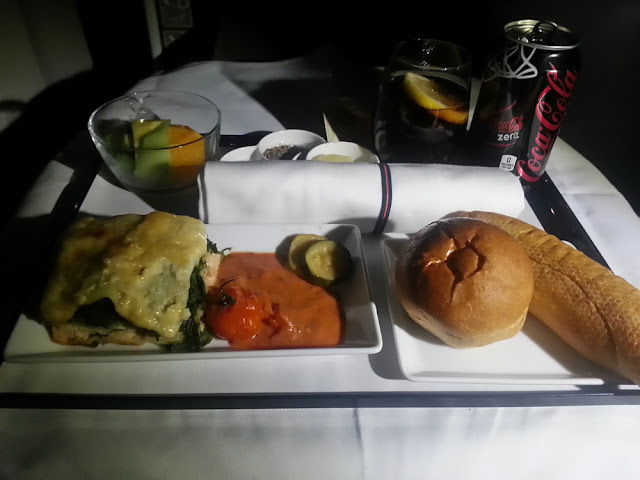 Anyway I ended up ordering a Coke Zero from her, then later rang another flight attendant to order my second meal. Eating in the dark again. This was actually really good - basically an open-faced ham sandwich with egg and more of that hollandaise sauce. Then more bread and this weird thing that's hard to see in the upper left of my tray consisting of a slow-boiled or poached egg (so the yoke is still runny) surrounded by a kind of chunky vegetable jell-o. 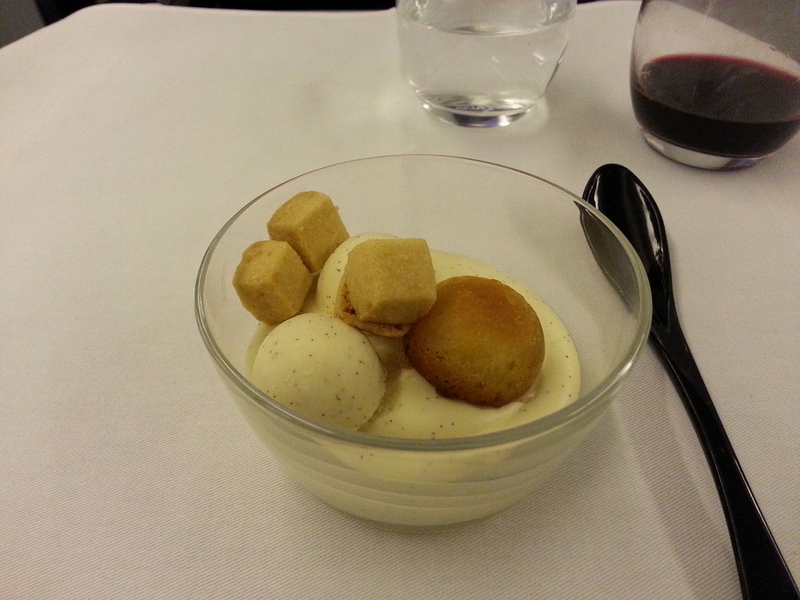 That was really the only thing I ate on either flight that I came close to deciding that I simply didn't like, though I did eat all of it. The egg part was good; the vegetable jell-o just made it a little odd. While I was eating, I fired up the IFE again to watch Life of Pi. By the time it finished, we were already descending. 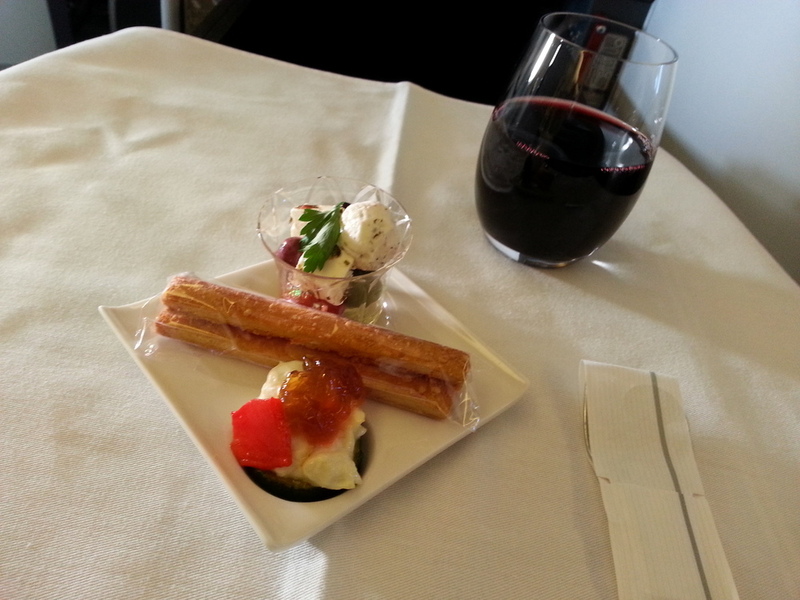 The landing was not uneventful like at Narita - in fact I experienced the second go-around of my life on this flight. The weather seemed fine through most of our descent, and it was only when I saw that we were at 3,000 feet holding for the ILS and the cloud tops were still below us that I realized things might get a little hairy. Sure enough, we hadn't yet broken out of the clouds when the high-resolution in-flight map showed us literally on top of the airport, and at that point I felt the surge in power of a go-around. On our second attempt, I felt a lot of power fluctuations and wind gusts as the flight map showed us nearing the ground, and I finally saw land at only about 100 feet. We had some pretty major gusts right before landing and ended up on one bogey before settling firmly down on the other. 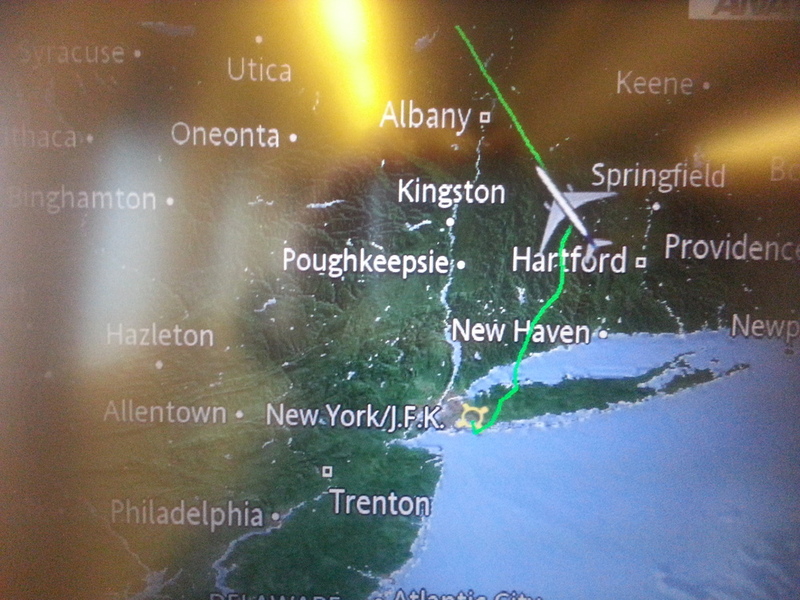 It was definitely a landing that got my heart racing, and when I listened to the ATC recordings on LiveATC later, I heard a lot of wind shear warnings and other airplanes that diverted to Newark at this same time. Outside at the airport as we waited for our taxi, it was definitely very windy and foggy. I normally hate flying, but it's amazing what just having things like lounge access, a good meal or a glass of champagne to look forward to can do. 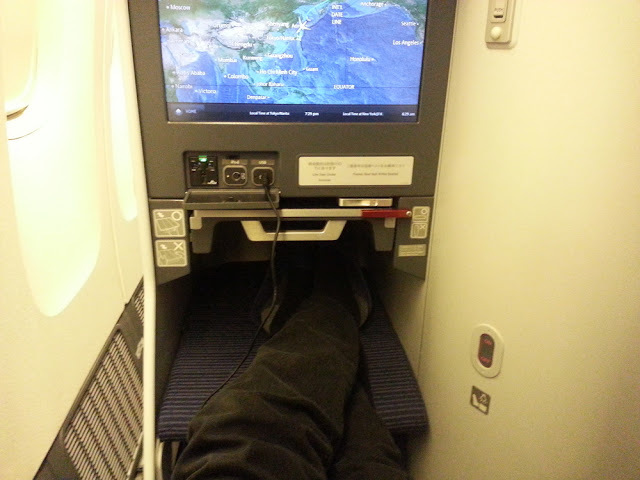 And being able to sleep properly during a long flight makes a huge difference in post-flight fatigue and jet lag. I actually looked forward to my flights this time. 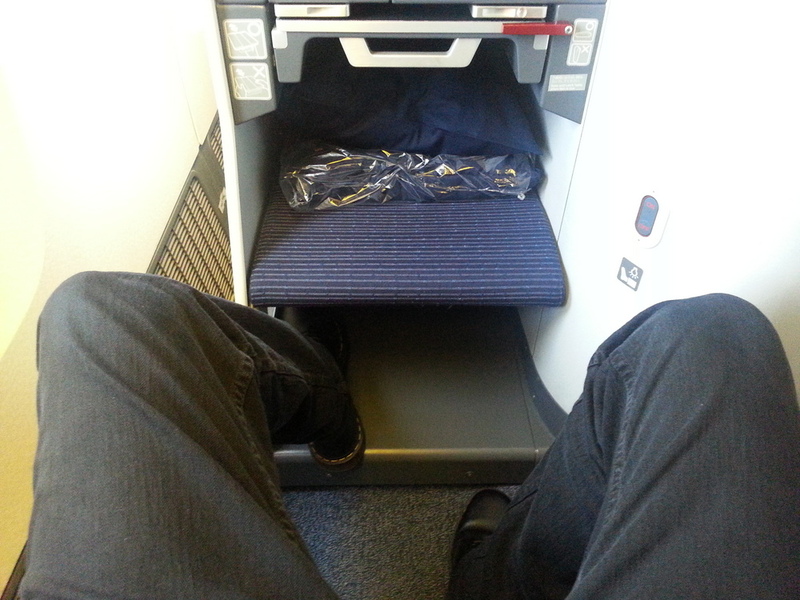 I really hope we can fly business class again soon - buying a ticket outright will probably always be too expensive for us, but I've learned that most people don't actually do that. 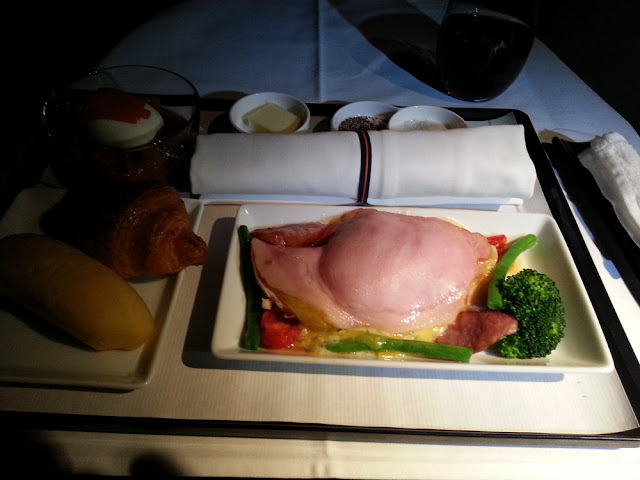 There are plenty of ways to get a business class ticket besides buying it from the airline! ANA's business class cabin offers a good amount of room, but it's pretty utilitarian in appearance. But it's that Japanese level of service that really elevates everything. There seems to be about one flight attendant for every two passengers, and they always seem to be around, anticipating your every need. I was so impressed when one of them knew my name before I even took my seat, and when another came over and introduced herself, and when another knelt down and asked me if I needed anything just after waking up (even if I was too out of it to answer properly). They are well trained even in seemingly small details like posture - whereas a western flight attendant will loom over you from above, a Japanese flight attendant will kneel down slightly below and look up to you to talk, making it clear that they are there to serve you. At the same time, it's also clear that they're in charge. It was interesting watching one of our flight attendants dealing with a drunk passenger who had trouble even mustering the strength to eat. When she placed his entree, she said "please enjoy your meal", and it sounded like a simple closing pleasantry. When he didn't eat, she came back a second time and said "please enjoy your meal" one more time, as if he hadn't heard or noticed before. When he still didn't eat, she came back again, looked at him in the eyes, waved at his food and said "please enjoy your meal" more sternly a third time. This time I realized it was not just a pleasantry, it was actually a command to eat. She wanted to clean up and check off that she'd fed him. This is the Japanese way - everything sounds very nice, but in actual fact you are being directed in ways that you may not even realize. Gotta admit, we had some pretty cute flight attendants this time too! That never hurts.